Villa Sammasan is a spacious holiday home arranged over four levels with sea views from nearly every room. On the top floor is the master suite. 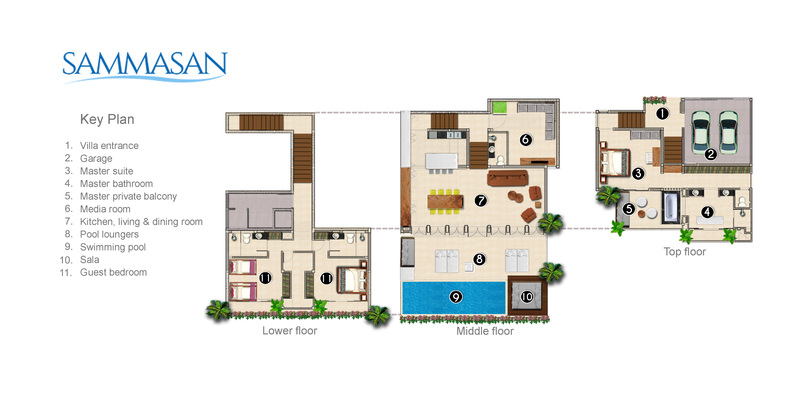 Below are the main living areas, including lounge, dining and kitchen, which open to the pool and pool terrace. Half a level down is the media room, and on the lower level of the villa are two guest bedrooms and a utility room. Interior staircases connect all four floors and every room has air-conditioning. An indoor parking garage offers space for two cars.